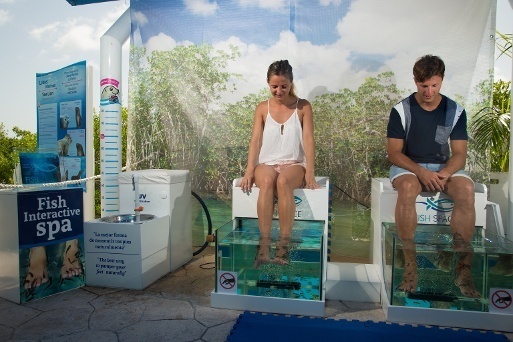 Enjoy a relaxing experience with authentic Garra Rufa fish that will you’re your feet a pleasant micro massage, making it 100% natural wellness experience. It is a unique feeling that creates positives moods. Garra Rufa fish give a pleasant micro massage that relaxes and enhances blood circulation. It helps to exfoliate dry and dead skin cells. It is a 100% natural wellness experience that you will remember forever. You will find this service by the bridge that connects the touch tanks area and the dolphin area.